Home » Coast to coast » Widespread solidarity with Gaza shown across U.S.
July 14 — As the Israeli bombing assault murdered what is now approaching 200 people in Gaza, about three-quarters of them civilians according to United Nations estimates, and with the Israeli army poised for a land invasion, people in solidarity with Palestine and against the Israeli war held demonstrations across the United States from Boston to Seattle to San Diego, some of which we report on here. For three hours, a strong delegation of Palestinians of all ages residing in Philadelphia, along with many supporters enraged by the criminal attack of USA/Israel against Gaza, gathered July 11 in front of the Israeli Consulate for the largest demonstration for Palestine in this city this year. Called initially by the Students for Justice in Palestine in response to a “Day of Rage” call from Palestine, the protest quickly gathered support among many individuals and organizations, including local Muslim groups and the Philly International Action Center, building through word-of-mouth and social media. Children with handmade signs, and young Palestinian women and men proudly wearing kaffiyehs and waving big Palestinian flags loudly shouted slogans with such energy echoing and building a link with the struggle fought in Gaza by their sisters and brothers. 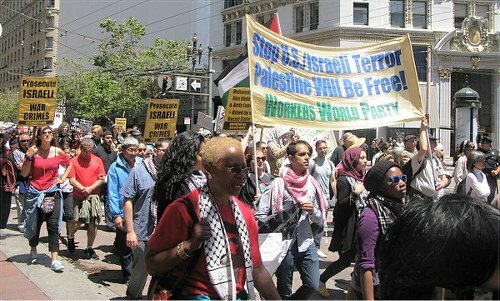 In a militant protest in San Francisco on July 12, called by the AYO-Arab Youth Organization of the Arab Resource & Organizing Center, over 1,500 people rallied and marched to “Say no to Zionism!” “Stop U.S. Aid to the Apartheid State of Israel!” “Free all our political prisoners!” and “Support the Palestinian people’s struggle for liberation!” Starting at Justin Herman Plaza with a rally, the protesters, led by a contingent of Palestinian flags, marched up Market Street to the United Nations Plaza, blocking all the lanes of traffic in the direction of the march. Stopping frequently, the marchers chanted, “From the river to the sea, Palestine will be free!” As they passed the shopping district, chants of “While you’re shopping, bombs are dropping!” rang out. On July 11, several hundred people gathered near the federal building in the center of downtown San Diego to protest Israeli aggression against Palestinian Gaza. The demonstrators, answering the call to protest by Al-Awda, the Palestine Right to Return Coalition, took over the four corners and traffic islands of a busy intersection. The targets of their anger were not just the Zionist terror weapons raining down on Gaza but also U.S. political and financial support for that murderous terror. Passing motorists showed overwhelming support for the protest. About 75 people in Tucson, Ariz., held an emergency demonstration on a hot July 11 afternoon against the U.S./Israeli attack. The multinational and multi generational protesters held many Palestinian flags. Honks and waves of approval came from the passing traffic. Some of the youths held signs that read, “I’m Jewish and I support Palestine” or some variation of that assertion, something new for a pro-Palestine demonstration here. Besides condemning the Israeli bombing of Gaza and the killing of civilians, speakers also attacked the FBI harassment of Palestinian Americans here and called for support for Rasmea Odeh. The action, which was sponsored by the Milwaukee Palestine Solidarity Coalition and endorsed by various pro-Palestinian organizations, marched to Sen. Ron Johnson’s office in the old federal building, east of the river, forcing police to stop cars as the marchers took over Wisconsin Avenue. On July 5, about 100 people, mostly young Palestinians, marched to CNN’s Atlanta headquarters, with another protest set for July 12. The International Action Center provided logistical support. 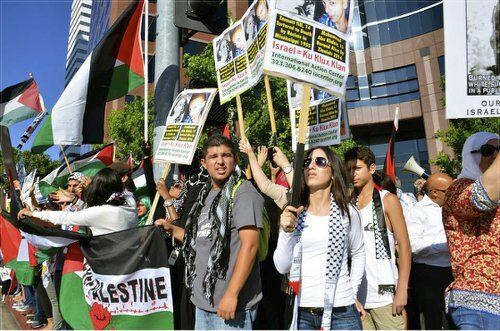 Hundreds of Palestinian youth and Palestine supporters lined the street in front of the Israeli Consulate in West Los Angeles on July 8. The enthusiastic crowd raised powerful chants against the U.S.-backed Israeli terror against Gaza, silencing the couple of dozen Zionists across Wilshire Boulevard. 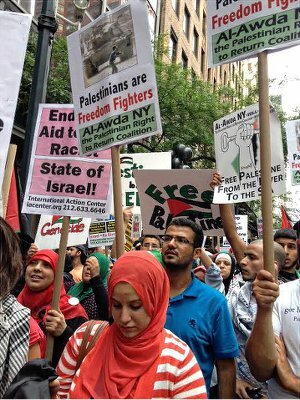 Al-Awda, the Palestinian American Women’s Association, Students for Justice in Palestine-U.C. Riverside, the Answer Coalition, Jewish Voice for Peace and the International Action Center supported the action. In Racine, Wis., people rallied July 12, demanding an end to attacks on Palestinians in Gaza. The Racine Peace and Justice Coalition sponsored the event. About 250 supporters of Palestine rallied in St. Paul, Minn., on July 11 to protest Israel’s brutal assault on Gaza. Sabry Wazwaz, of the Minnesota Anti-War Committee, urged rally participants to step up efforts to support Palestine. The protest was called by the Minnesota Coalition for Palestinian Rights and the Women Against Military Madness Middle East Committee. Another demonstration will take place July 14 on May Day Plaza. 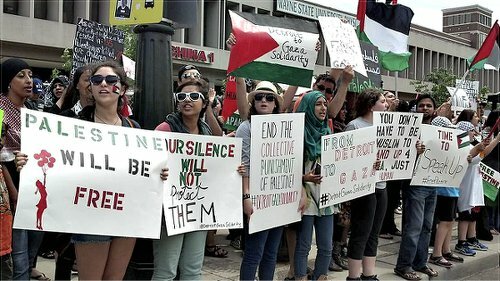 More than 1,000 people marched in Detroit on July 13 to “protest against Israel’s collective punishment of Gaza and its violence against Palestinian youth.” The demonstration, predominantly youthful, was organized on Facebook and other social media and was led by young Palestinian and Arab women. The action was underway before the official start time, as hundreds gathered across from the Max M. Fisher Music Center, where the Concert of Colors, part of the 22nd annual Diversity Festival, was taking place. They were joined by hundreds more before the swelling crowd began marching up Woodward Avenue for a rally at a park across from Wayne State University. “Occupation is a crime from Detroit to Palestine!” and “From Gaza to Detroit, water is a human right!” were two of the many chants. 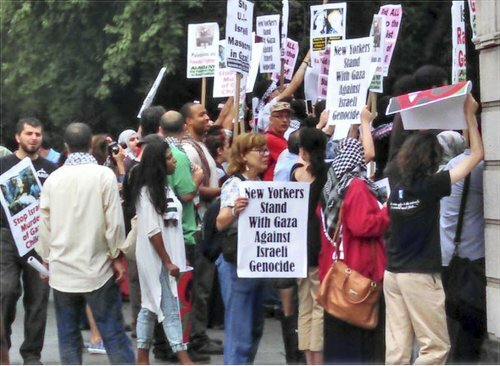 Connections were also made with protest placards and by rally speakers between the struggle in Detroit against emergency-dictator-imposed austerity and water shutoffs and the struggle of the Palestinians in Gaza. U.S. financial and military “aid” to Israel was denounced as were the ongoing genocidal bombings. Workers World Party, the Michigan Emergency Committee Against War & Injustice and Moratorium NOW! Coalition activists participated. More demonstrations are set for this week, including in Buffalo, N.Y.
We thank Terri Kay, Gloria Rubac, Paul Teitelbaum, G. Dunkel, Kris Hamel, Maggie Vascassenno, Berta Joubert-Ceci, Bob McCubbin and other WW bureau writers for the reports, as well as fightbacknews.org for reports from Chicago, Racine, St. Paul and Tampa.